Thanks for your desire to support the missional work the Lord is doing at and through Portico Church in the City of Charlottesville and beyond! 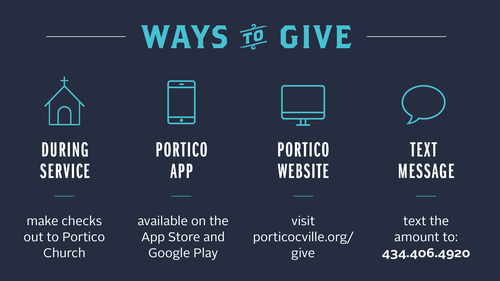 There are several ways to make your financial gift to Portico Church, so please scroll down and check out the different ways below . Feel free to reach out to us if you have any questions! Text an amount to 434.406.4920. Make checks out to Portico Church, or drop cash in an envelope in the collection bag.